Our Reindeer Dancer is just the perfect size for a holiday mug rug. This is the best time of year to have mug rugs around. 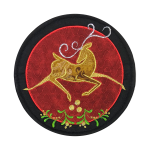 These elegant Reindeer mug rugs are perfect for those intimate holiday gatherings. Your wine glass will sit perfectly on these beautiful mug rugs, who says they are only for mugs anyway? These are perfect during this time of the year. Complete color instructions for both the round and the square mug rug. 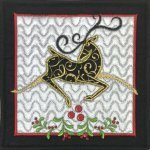 The images (reindeer, reindeer and holly and the holly) also come separately so you can add them to dish towels, placemats, bags etc. for your holiday enjoyment and they will fit in the 5"x 7" hoop. SVG Files for your home cutting machines. The ITH Mug Rug finishes at approx 8"x 8" square and round. Our goal is to provide you with the best customer service and the best designs in the industry. Check out our Mug Rug Club and receive exclusive, club only designs every month. Get more info here.